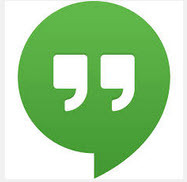 This post is a dual part 1, both for the use of Chromebooks and for the use of Google Hangouts. I just want to share a very exciting experience that the Phoenix (5th) class is having this week. A new student is unable to attend school this week for family reasons. However, thanks to technology help from Vinnie [me], advice from a middle school history teacher, the support of administration, and the fifth grade Specials teachers, this new student has participated in just about every lesson and class this week via Google video chat (Hangout) on a Chromebook. A Phoenix (5th) student who is at school is in charge of the Chromebook for a period or two. This student connects with the new student in the morning, points the laptop camera at the teacher/speaker or the white board/SMARTBoard during lessons, and signals me if I don’t notice that the new student has her hand raised. The new student can hold up her homework for me to check, raise her hand and get called on, sing along in Choir, work with a partner during small group assignments, and be part of every conversation that happens in each class. Later this week, when her small group makes a presentation, the new student can deliver her part by addressing the class on the projector! Yes, I am fending off just a bit of wishful thinking from the other students (“I wish I could learn from home while cuddling my dog!”), but the advantages are just delightful. I sent home NO specially prepared work before her absence, I have postponed NOTHING in my lessons/plans for the week, and I will have NO catch up to do with the new student when she returns. This is one of the numerous reasons I am ecstatic about our middle school 1:1 Chromebook initiative we began fourteen weeks ago in August.